When painting with a broad brush, you could call Paso Robles a warm winegrowing region. And it's true that Burgundian varietals such as Chardonnay and Pinot Noir—which are known to excel in cool regions—aren’t typically associated with Paso Robles. Here, it’s Bordeaux and Rhône varietals that make the most noise. But the broad brush often misses the nuances, and that's why we are confidently producing Chardonnay and Pinot Noir from our estate Margarita Vineyard in the Paso Robles AVA. Margarita Vineyard is the southernmost vineyard in the region, with a pronounced marine influence. It's often cool and sometimes cold here during the growing season. That's our baseline. From there, we've planted our Chardonnay and Pinot Noir in the vineyard's coolest spots. One such spot is at the mouth of Trout Creek, where marine air spills through a notch in the coastal mountains. In these spots, the notion of growing a premium Paso Robles Pinot Noir or Chardonnay isn't wild and crazy. It's simply a logical fit for the growing conditions. On that note, we are excited to release our 2012 Chardonnay from our White Label (reserve) series. 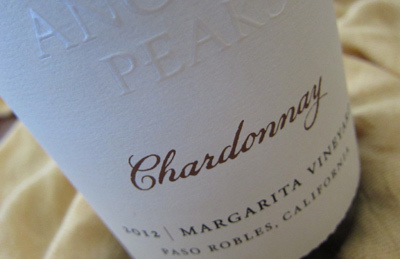 We think that this wine shows just how good a Paso Robles Chardonnay can be. This follows our 2011 Pinot Noir, which was also varietally true and equally delicious. Right now, these wines are very limited in production (in the range of 100 to 150 cases), with our wine club members getting first dibs. Our Chardonnay and Pinot Noir will never supplant our Bordeaux varietals in acreage or production. But we are excited about where these wines are headed. They speak not only to the diversity of our vineyard, but of the Paso Robles region as a whole.